On Thursday 1 December, massive efforts were made across the globe to mark World AIDS Day, a pioneering global health campaign that has been organised by the World Health Organisation (WHO) on an annual basis for the past 30 years. It was no different in Bhubaneswar, with the Odisha State AIDS Control Society (OSACS) doing their bit to raise awareness at the Odisha Hockey Men’s World Cup Bhubaneswar 2018. 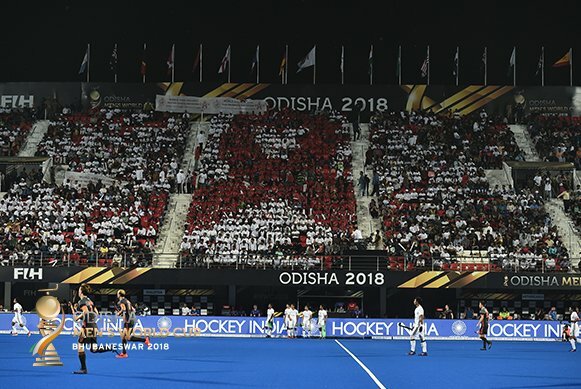 Ahead of the day’s action on the field, OSACS distributed T-shirts and caps to more than 2,600 spectators, who positioned themselves in the formation of a human ribbon – the symbol of World AIDS Day – in the west stand at the Kalinga Hockey Stadium. The decision to make the gesture at such a high-profile sporting occasion was certainly a smart one, with a global broadcast audience of millions witnessing the symbol created by the fans in the stand. World AIDS Day is designed to spread awareness and eradicate stigma associated with HIV/AIDS. The theme of World AIDS Day 2018 is ‘Know Your Status”. To learn more about World AIDS Day, click here.